In any given year, the Federal Communications Commission confronts many issues of interest to economists. This paper summarizes four issues of interest during the last year: Spectrum Auctions, Media Ownership, Quality-Adjusted Cable Prices, and Leased Access. It highlights the role that economic analysis played in each and identifies areas where further research would be fruitful. This article was drafted while the first author was Chief Economist at the Federal Communications Commission. The opinions expressed here are solely those of the authors and do not necessarily reflect those of the Federal Communications Commission, its Commissioners, or its staff. We would like to thank Larry White and Tracy Waldon for helpful comments. Crawford, G. (2007). Television station ownership structure and the quantity and quality of television programming. Discussion paper, Federal Communications Commission. Available at http://www.fcc.gov/mb/mbpapers.html..
FCC. (2000). 1999 Report on cable industry prices. Discussion paper, Federal Communications Commission. Available at http://www.fcc.gov/mb/csrptpg.html..
FCC. (2001). 2000 Report on cable industry prices. Discussion paper, Federal Communications Commission. Available at http://www.fcc.gov/mb/csrptpg.html..
FCC. (2004a). 2003 Report on cable industry prices. Discussion paper, Federal Communications Commission. Available at http://www.fcc.gov/mb/csrptpg.html..
FCC. (2004b). Report on the packaging and sale of video programming to the public. Discussion paper, Federal Communications Commission, 18 November 2004. Available at http://www.fcc.gov/mb/csrptpg.html..
FCC. (2005a). 2004 Report on cable industry prices. Discussion paper, Federal Communications Commission. Available at http://www.fcc.gov/mb/csrptpg.html..
FCC. (2005b). Eleventh Annual Report on the Status of Competition in the Market for the Delivery of Video Programming (2004 Report). Discussion paper, Federal Communications Commission. Available at http://www.fcc.gov/mb/csrptpg.html..
FCC. (2006a). 2005 Report on cable industry prices. Discussion paper, Federal Communications Commission. Available at http://www.fcc.gov/mb/csrptpg.html..
FCC. (2006b). Further report on the packaging and sale of video programming to the public. Discussion paper, Federal Communications Commission, February, 2006. Available at http://www.fcc.gov/mb/csrptpg.html..
Milyo, J. (2007). The effects of cross-ownership on the local content and political slant of local television news. Discussion paper, Federal Communications Commission. 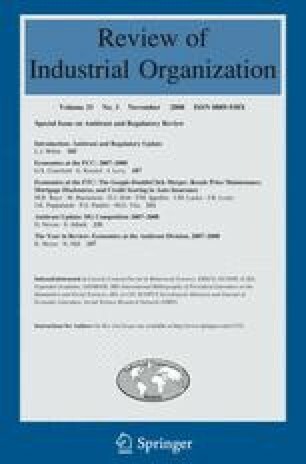 Available at http://www.fcc.gov/mb/mbpapers.html..
NCTA. (2008). Talking points on cable pricing. Discussion paper, National Cable Television Association, Available at http://www.ncta.com/PublicationType/TalkingPoint/CablePricing.aspx. Accessed 4 March 2008. Shiman, D. (2007). The impact of ownership structure on television stations’ news and public affairs programming. Discussion paper, Federal Communications Commission, Media Ownership Study #4, Section 1. Available at http://www.fcc.gov/mb/mbpapers.html..